Today I have a special recipe for you inspired by Slovenian cuisine. A few weeks back when I was in Slovenia I had a buckwheat salad which I found at the salad bar of a restaurant in a shopping centre. The salad I had was quite simple, mostly buckwheat groats with a couple of other vegetables. 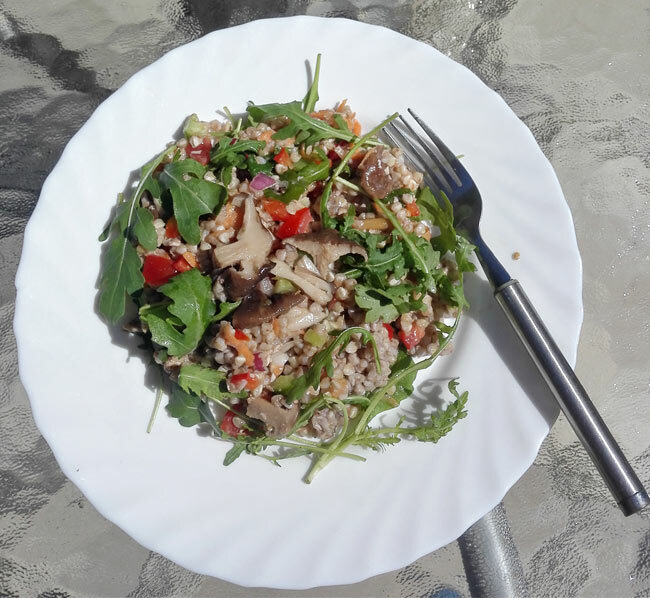 The buckwheat flavour of this salad was definitely standing out so when I came back from Slovenia last week I decided to create a buckwheat salad which would be better than that – a salad full of vegetables which would all balance that earthy buckwheat flavour. To create this special salad I did some online research first, looking at Slovenian forums for an inspiration. The recipe I came up with it’s nothing like anything that I’ve seen online. I previously made buckwheat and mushroom soup and I know very well that mushrooms go very well together with buckwheat so my salad had to have some mushrooms! For the base of the salad I decided to use peppers, tomatoes, red onion and grated carrots, of course, all mixed together with buckwheat groats. When serving the salad I would then add rocket and pickled mushrooms on top. The final result was a little bit unusual but the salad came out really tasty and all the flavours complimented each other really well. In case you are not familiar with buckwheat, buckwheat is naturally gluten-free and it’s actually classed as a seed, not a whole grain. It is a nutrient-rich food containing a number of essential vitamins and minerals your body needs for good health such as B vitamins, magnesium, calcium, iron and zinc. Buckwheat is great for those who want to improve their heart health as it’s been proven to lower inflammation and unhealthy cholesterol levels. 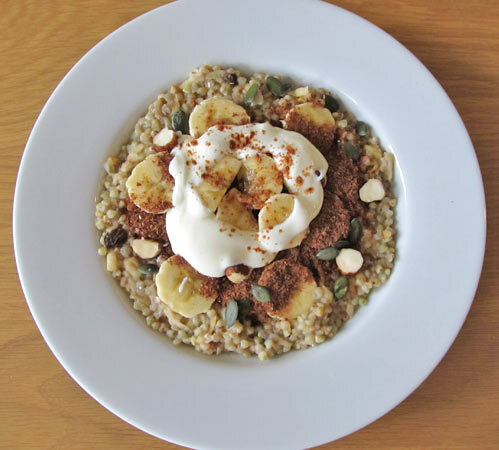 Comparing to whole grains, buckwheat contains more protein (roughly 11-14 grams of protein for every 100 grams) which makes it a great food for vegetarians and vegans. In Slovenia, you can buy buckwheat groats just about everywhere but in England, it’s a little bit more difficult. Bigger supermarkets may have it but I am not sure about the quality. I managed to find organic buckwheat groats of a great quality in my local Polish shop. If you cannot find it anywhere, you can buy it on Amazon. When you cook buckwheat, beware, the little seeds will triple in size! 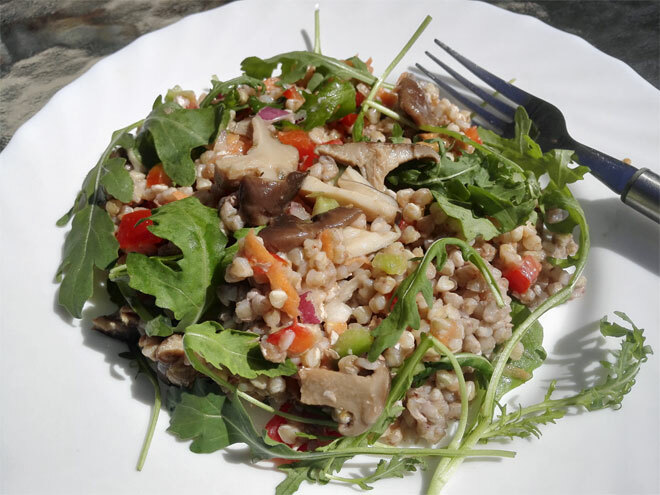 I made this mistake by using one cup of buckwheat groats for this salad but it was way too much. I ended up eating this salad every day for about 3 days! Boil buckwheat groats together with a bay leaf in twice the amount of water for around 15 minutes. While buckwheat is cooking prepare all the vegetables: chop peppers, red onion and tomatoes and add them to a big bowl. Grate a small carrot and add it to the rest of veggies. Mix everything together. 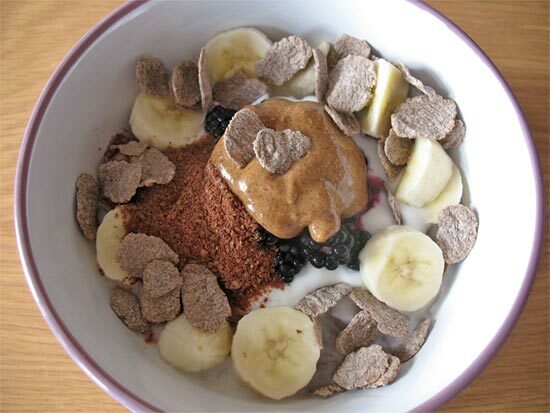 Once the buckwheat is cooked spread it onto a large plate to cool down. While buckwheat is cooling down squeeze the lemon and slice the pickled mushrooms. Get the rocket ready as well. Add cooled down buckwheat to the bowl with vegetables, season it with salt and pepper and add the lemon juice together with extra virgin olive oil. Mix everything together and taste to see whether you need to add any more olive oil, lemon juice or salt. To serve, place the salad onto a plate, add a handful of rocket and sliced pickled mushrooms on top. You can use apple cider vinegar instead of lemon juice. You don't have to use all the ingredients, you could simplify the salad and skip mushrooms or any other ingredients. If you don't have pickled mushrooms you could simply slice and fry some mushrooms quickly. To get all flavours to come together leave the salad in the fridge for at least 30 minutes before serving. What do you think of this salad? Are you going to give it a go? * This post contains affiliate links. If you purchase a product after clicking on a link I may get a small commission. This does not cost you anything. I haven’t tried buckwheat with roasted vegetables yet but that’s a great idea, I will give it a try next time. I love the balance between earthy and bright flavors in this dish. 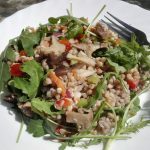 It never occurred to me to try buckwheat groats in a salad before, but I will definitely be trying it out in the near future! I really love the combination of all the flavours, they go so well together. Let me know if you do try it, would love to know how it turned out! So interesting that buckwheat groats are available more readily in Slovenia! I have to say buckwheat flour is an acquired taste for me, but I haven’t tried groats. Buckwheat definitely has a special flavour but I do like it a lot. 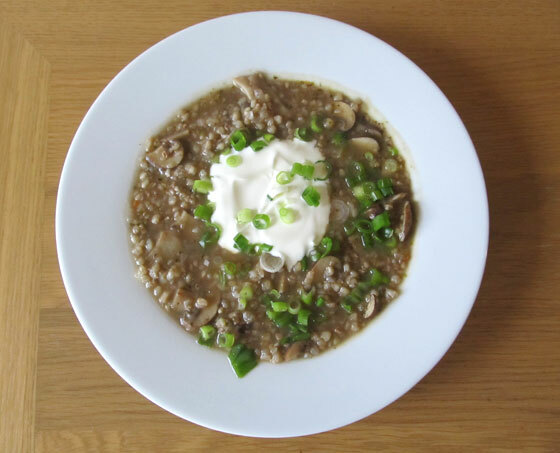 In Slovenia, buckwheat is more popular, especially in Eastern regions.